ON 12 January, the Hong Kong police celebrated its 175th anniversary by holding an open day performance. Acts included marches, songs by the police band and police dog obedience exercises. There were also toy police cars and motorbikes for the children. The Hong Kong Police Force 175th Anniversary Open Day began at 10.30am, and showcased different departments, along with marching drills that showed the history of the police force by holding different formations. Moreover, the police dogs also showed how they perform CPR (心肺復甦術). The highlight of the performance was the anti-terrorism exercise, with gunshots, explosions and police officers dropping down from helicopters. 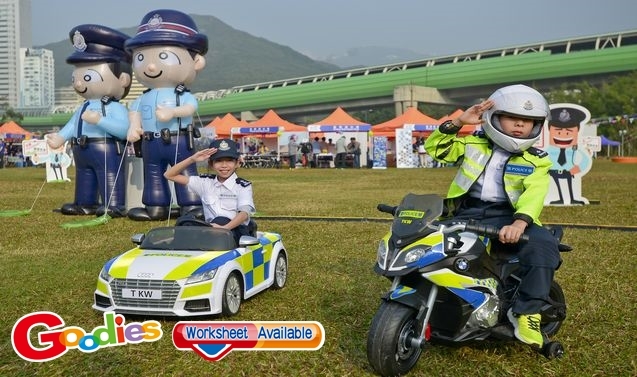 The police hoped that through the open day, they can show their professionalism to Hongkongers. 1. How long has the Hong Kong Police Force existed? 2. What did the dogs not perform? 3. Which was part of the anti-terrorism show?